Faster than a reliable New York subway train, more adorable than a bunch of kids eating breakfast, more intriguing than a Japanese bike garage: Indeed, this week was pretty super. It offered a few life lessons we won’t soon forget. For example, kids take to coffee in a similar manner that we take to low-carb diets. To them, the mere mention is revolting. And you will learn this too, because the week has been so very kind to us in the adorably hilarious video department. Children can be a finicky bunch. Getting them to eat their vegetables is about as enjoyable as mowing the lawn or watching a Paul Blart movie. 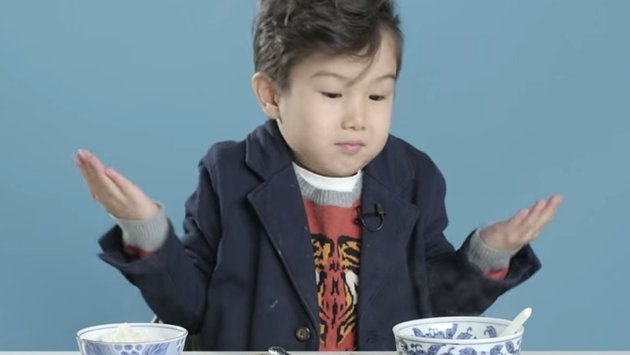 However, this video compilation of kids sampling foods from around the world is pure gold. We always wanted to race a subway train, but our hands were always full with street food and our legs were, well, we were sitting. Thanks to Epic Challenges we have definitive proof that you can indeed take on a mighty train and win—or at the very least you can tie in a spectacular manner. Bike locks are a pain. The nuisance pretty much ruins the joy and freedom that comes with setting upon the street with your bicycle as your baseball card goes flippy flappy in the spokes. If only there were an automated garage that sucked in your bike and spit it back out when you needed it. Oh, there is, and it’s in Japan. Visiting the local mall took an unexpected and wholly entertaining turn recently for those in Massapequa. Shoppers slowly turn into revelers thanks to magic supplied by Disney shadows lurking behind a couple of doors. Sadly, the only thing we ever get from a trip to the mall is indigestion from the food court. In case you were wondering, the future arrived earlier this week. It didn’t come in the form of flying saucers or Mattel hoverboards. In the end, the future arrived in the form of a safe, slow-moving driverless car. It has us pondering a visit to Greenwich. Like a teenager pouting in its room, San Francisco went absolutely dark this week. In reality, it was photographer Toby Harriman who pondered what the city would look like as Gotham, and we are glad he did. If Batman ever tires of doling out vigilante justice on the currently frigid east, he can always move out west and not miss a beat. And, if he needs a partner in crime fighting, we hear there is a man who can outrun a train in New York.